For this personally timely and professionally invaluable piece of work I would like to give huge thank you to Mr. Vince Froehlich….the owner of North Fork Angling LLC and a full-time professional fishing guide & outfitter, operating currently in WA State. I will post the pics in the best order I can and cut the text in below. Thank you. 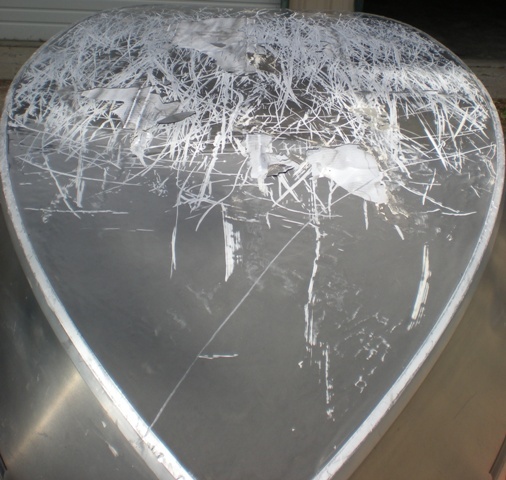 Epoxy coatings are nothing new to the aluminum drift boat industry. However, for the last three decades, drift boaters & guides have had little choice in the available products on the market; and for the most part, the two major brands (Coat-It & Gluvit) have fit the bill. Only there is a problem with these epoxies that is rarely talked about. 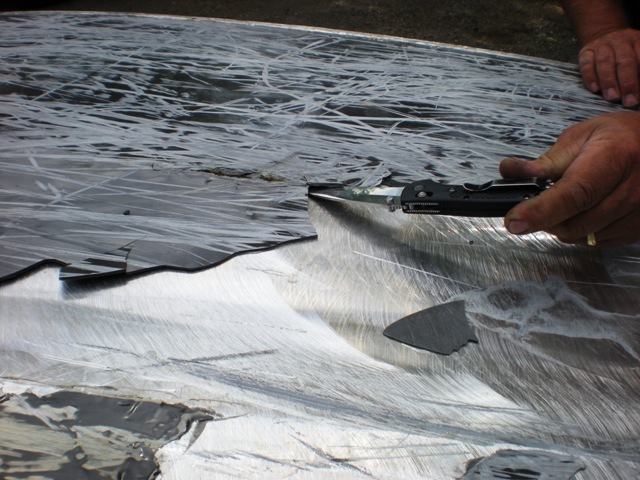 The obvious issue with aluminum drift boat construction is the necessary use of light-gauge, lightweight material throughout the boat (including the floor), which increases the amount of flex the bottom is put through when stressed on the rocky shallow waters of our NW rivers. While some try to justify this and consider the flexing a benefit to performance, others (including myself) agree that it does nothing but reek havoc with the bottom coatings. 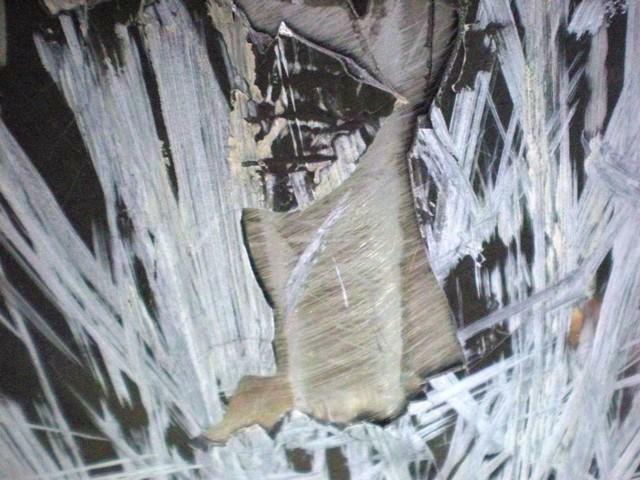 Most coatings (including the two mentioned above) do not allow for the range of the flex phenomenon causing the epoxy to spider-web, delaminate, and inevitably lift and break off – sometimes in large pieces. UHMW sheeting is a controversial newer alternative with a big price tag and must be factory applied on a brand new hull – rendering it a non-option for most drift boat owners. As a professional guide, I couldn’t seem to get more then six to ten trips down the river before the epoxy coating was damaged beyond patching up; thus causing the need to re-coat the entire bottom surface completely. This is not only labor intensive, it’s time consuming and can be quite an expensive process. 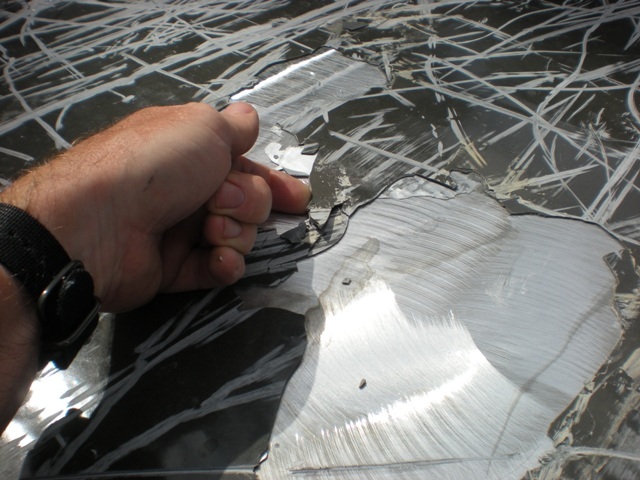 So, I started looking for a new high-performance coating that would allow for optimum adhesion to the aluminum surface, yet have enough flex to move with the bottom under stress, and still be slick & tough enough to glide easily over the rocks when necessary. Wearlon Wetlander Top Coat is a water-based silicone epoxy coating that has unique release properties while adhering to a broad range of substrates; including wood, fiberglass, metals, concrete and other epoxies, polyurethanes etc. The flexing properties, and low coefficient of friction in regards to this product are nothing short of incredible. Wetlander comes in a two part kit with the coating resin and a curing agent hardener. I was sent a 1/2 gallon kit that is enough to coat up to 100 sq ft surface area with a 3-4mm layer; plenty for a drift boat bottom. It can be sprayed-on, rolled-on, or brushed-on, the latter of which I did (and later wished I had sprayed it for aesthetics). Prepping the boat bottom is nearly the same as you would for Coat-It or Gluvit. I won’t go into too much detail here, but this is a laborious and an all-out dirty job so wear eye protection and a dust mask. 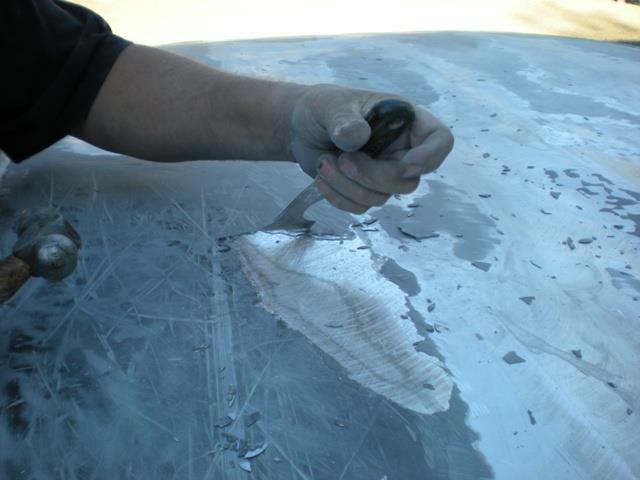 Basically, you remove the old coating that is loose, chipped or damaged; scuff the aluminum surface with medium grit sandpaper; blow off with compressed air, and then clean liberally with acetone. Allow it to dry completely. Mix the coating resin with the curing agent and blend accordingly; then apply. There is no “sweat” or induction period needed with this product; you simply mix it up and put it on. Curing time is as little as 48 hours, however the manufacturer recommends a week of curing before putting it into use. Once cured, this product is slick ! ..no really; it’s very, very slippery ! Overall test results were much better than anticipated and certainly exceeded my expectations in every category. I am very pleased with how this coating material holds up and performs over the rocks, including launching and loading on unimproved ramps. And after several trips, there is no delaminating, separation, chipping or breakage – anywhere. 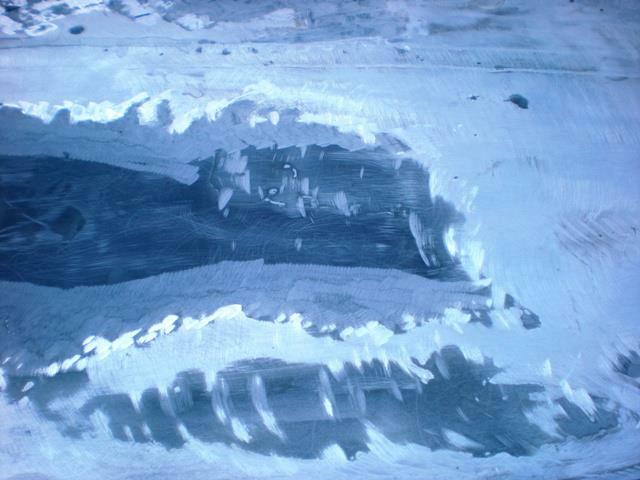 Just a few scrapes and marks which are typical on any coating. As far as friction goes, there isn’t any; in fact, what used to take some muscle to push my boat off the trailer, now just takes a quick shove and then the mad dash to hang-on as it departs. Loading up is just as easy and feels as though the bottom of the boat is greased. Consequently, when transporting your boat to and from un-improved launches, you need to make sure it is strapped onto the trailer or it will slide off ! Seriously. 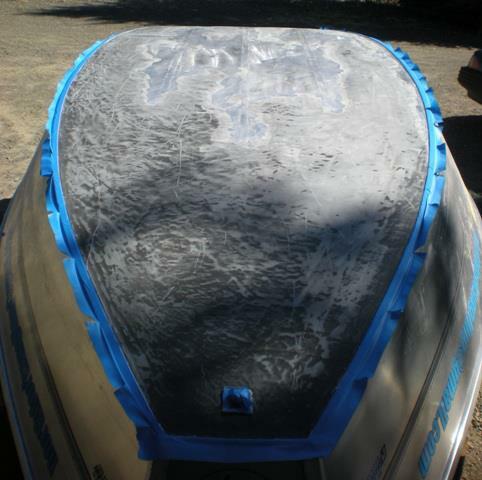 Pictures included are of recently applied Coat-It; and the boat was run for only 6 trips on the Klickitat River in low water conditions. 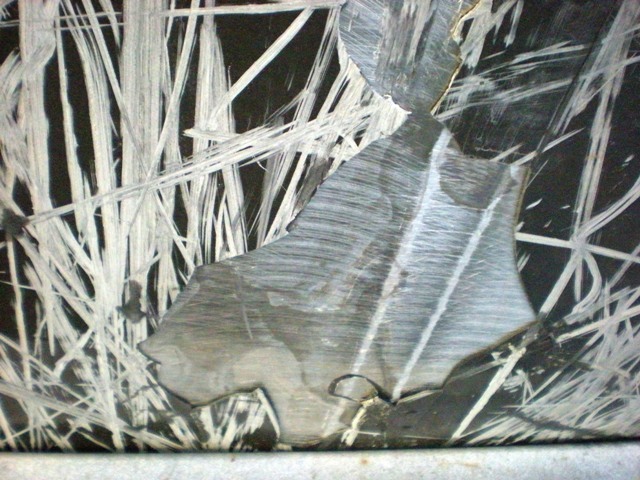 The damage shown is severe and beyond patching. 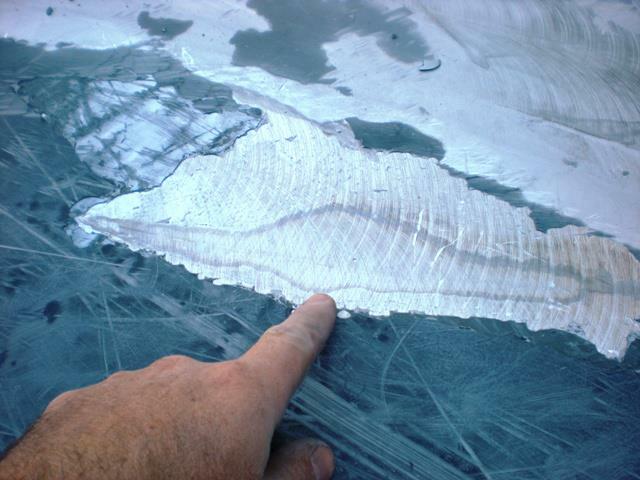 The coating was removed where lifted, missing or broken; ground smooth with no leading sharp edges, then hand-sanded to scuff the entire surface in preparation for the new coating. Twice the number of trips; same river section, and pictures of the bottom re-coated with the Wearlon Wetlander Top Coat. It looks and feels like it was just applied ! This bottom coating proved superior and outperformed the commonly used product in everyway possible. 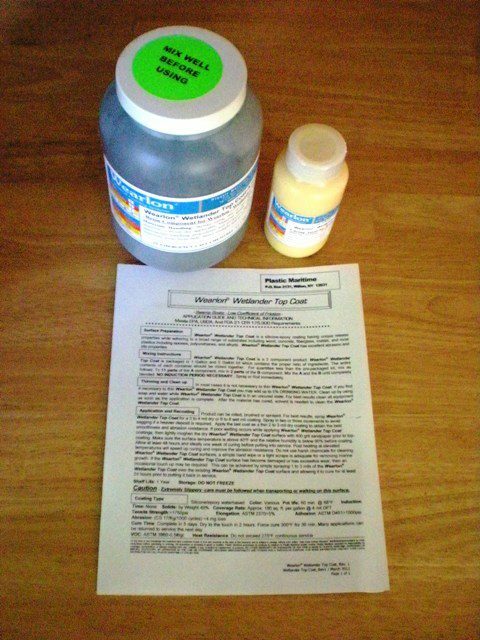 Coat-It, Gluvit, and Wearlon Wetlander Top Coat are registered trademark names. TRIPLE A WOULD LIKE TO GIVE VINNIE FROLICH A TREMENDOUS VIRTUAL HIGH FIVE FOR THIS KICK A** DEMO. SOMEBODY ELSE MISSED OUT BIG TIME. THANKS FOR THINKING OF US HERE AT AAA BUDDY. Outstanding tutorial. Although I have a glass boat, I still get off on stuff like this. Awesome write up, killer pics and really terrific Information! Well done Vinnie!!!! On pretty interested in doing this. Great information there. Thank you Vince! Interesting article! Their website http://airboatcoatings.com has a lot of info – mostly airboat related, though. Just an update on Wetlander. 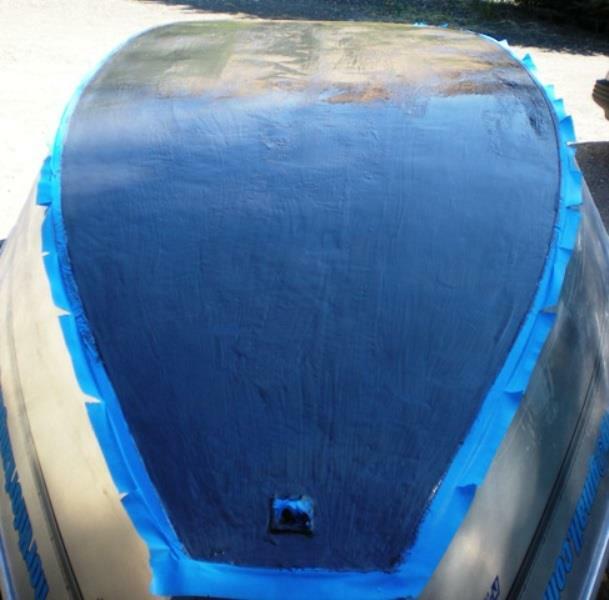 We are testing this bottom coating with the primer base / epoxy primer / and Wetlander Top Coat, on two different fiberglass drift boats this season. Wetlander claims that this 3-part system with adhere to fiberglass like no other coating there is; so stay tuned for some more information. 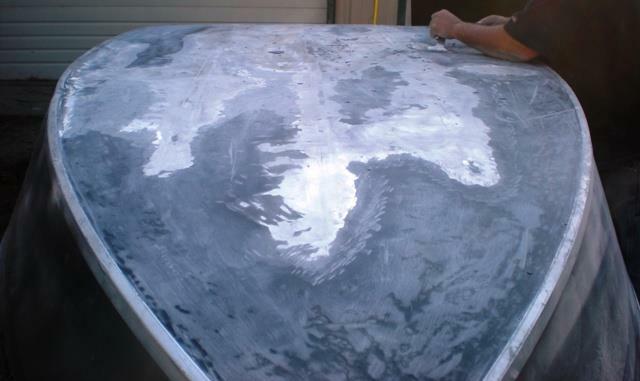 After running this on an Aluminum boat last season; I can’t imagine better results – but we anticipate superb results on a glass hull as well. Also, for those that are interested in using Wetlander and wondering how and where to get it; Good News. I have worked a deal with Plastic Maritime Corporation to act as the West Coast Distributor for the coating products and I am now taking orders. So give me a call or email me and I’ll hook you up and save you some money. Just a great testimonial from a believer ! Good Stuff ! I just put the 3L system on my Willies the beginning of this year. I do the McKenzie, upper Willamette, Siuslaw, Umpqua and Deschutes. If you know those rivers you know I put it though the toughest conditions imaginable. I scrape gravel bars every time I’m on the Willamette and McKenzie, and on the Deschutes and Umpqua the lava rock is as sharp as diamonds. I’m ½ way into the season and took a look at it yesterday. Not one touch up needed. It is an interesting product as it seems to come off with the slightest touch but it must just be the top micro layer because I’m into over 20 trips and it’s holding up strong. I put it on the chine as well. That’s the lowest part of the boat so why not protect it and besides, with all the colors available it’s a great way to show some style. 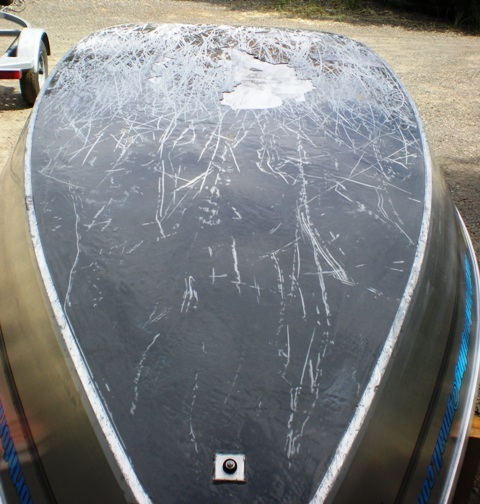 One thing to watch out for is that your boat is going to slide off the trailer…FAST! Vince was not kidding. My first time out I almost lost the boat on the launch. This stuff is slick! Oregon Duck season just around the corner. I’m going to need a ½ gallon of Oregon Duck Green. 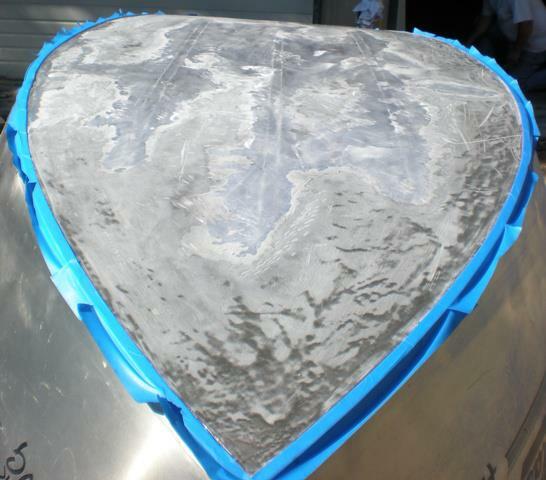 Will this product on a wooden drift boat to topped leaks if applied instead of using fiberglass coth and resin?